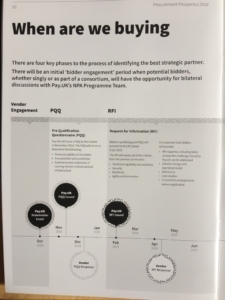 On 18th October 2018 Pay.uk – the re-branded New Payment System Operator – held a launch event and distributed brochures about their procurement process for a strategic partner with whom to develop the New Payments Architecture – or “NPA” – for the UK’s retail payments. 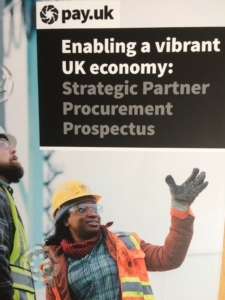 The prospectus was entitled “Enabling a vibrant UK economy”, so we learned that Pay.uk and its backers acknowledge that NPA – and therefore Pay.uk as well – has a major scope of power not only over UK payments but over the entire UK economy. This is the point we made in our post “Pay.uk – our new zaibatsu”. Pay.uk and NPA have the power to enable a vibrant economy but also to mess up the UK economy if they fail. Their acknowledgement of this fact makes the rest of what we learned all the more disturbing. We discovered that the procurement process begun in 2017 by Faster Payments was worthless. Faster Payments began that process with a Request for Expressions of Interest, and followed that up with a Request for Information. The latter was directed to all who responded to the Request for Expressions of Interest and more, so there was no whittling down. to procure the settlement layer of NPA. We now learned that this exercise has been completely aborted and that Pay.uk will start afresh with a “Pre-Qualification Questionnaire” to be issued in Q4 2018, and that there will then be a Request for Information issued in Q1 2019, to which bidders will be asked to respond in Q2 2019. That is a nice lot of paperwork for the vendors to compile (if they can get internal funding to do it, given that many will have strained their own credibility by making the case to participate in the process that has now been aborted). Then it is a very nice lot of paperwork for Pay.uk to work through, with adequate expenditure of time, programme management, internal communication, steering groups, advisory groups and so on. That can be spun out into Q3 2019 without much difficulty. Then the process will move into the more serious Request for Proposal, issued in Q3 2019. The RFP responses will be due in Q4 2019, a shortlist will be published in Q1 2020, a further process will be gone through with the shortlisted candidates in Q1 2020, and then a decision will be made in Q2 2020. 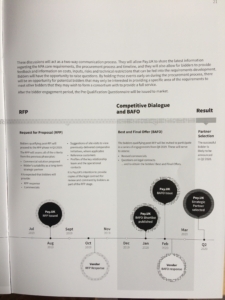 At this point the timeline in Pay.uk’s brochure runs out. establishing the IT and operational environment in which to commence the build. These tasks can be expected to account for the remainder of 2020. The completion of migration – meaning the start of the availability of NPA to build “overlay services” on top of it – cannot then be before 2024. We also learned that migration onto the new retail payments infrastructure cannot begin until the successful completion and post-conversion support of the Bank of England’s RTGS renewal programme, and the migration phase of that project looks like a 2022 event. So we learned that the timing of NPA is from 2023 onwards, and maybe it is not even this good. The procurement exercise is to select a strategic partner with whom to develop NPA: it is not a procurement of NPA. The wording used by Pay.uk leaves open the possibility of a further definition phase after the selection of the partner, for the partner and Pay.uk to define what they want and to then contract on it. Should a definition phase be required after the partner selection, we can add another year onto the start of migration. As a consequence of that fact we also learned that the NPA Blueprint as handed to NPSO by the Payment Strategy Forum in December 2017 was not an implementable plan. The NPA Blueprint was formally handed over to NPSO at their event on 8th December 2017, but the main statement of endorsement was contained in a handover letter addressed to the “Payments Community” dated 30th November 2017 and issued in the name of the leading members of the Payment Strategy Forum. They represented that “the Blueprint defines a new architecture for payments in the UK”: it turns out not to have defined very much at all. They warranted that “Implementation of the Blueprint will create simpler access, more competition, greater innovation, increased adaptability and reduced financial crime”: as the Blueprint was not an implementable plan, it is to be questioned how the list of benefits will be created. Their final valedictory sounds rather limp given what we now know: “It is now over to New Payment System Operator and UK Finance to maintain this level of engagement with users and to deliver, in a timely manner, this Blueprint to meet their current and future needs”. Would a completed migration onto NPA in 2026 be regarded as timely, when the Payment Strategy Forum was established in 2015? One hardly thinks so.